Sargent’s dazzling and unforgettable image of Lady Agnew is one of the most famous of his many portraits of fashionable London society. For both the artist and his sitter, the painting was an instant success, establishing Sargent’s reputation as the portrait painter of choice for the London elite and immediately transforming the newly elevated Lady Agnew into a society celebrity. The sitter was born Gertrude Vernon and married Andrew Noel Agnew in 1889. Her husband, fifteen years her senior, was a barrister and later an MP and deputy-Lieutenant in Wigtownshire; he succeeded his father as 9th Baronet of Lochnaw in 1892, shortly before Sargent embarked on this portrait. The exact circumstances behind the commission are not known, but the Agnews may have met the artist through mutual American friends. According to notes in her husband’s diary, work on the portrait progressed swiftly, and Sargent later recalled that it was painted in just six sittings. Lady Agnew is shown seated in a Louis XVI chair against the backdrop of a Chinese silk hanging, both of which were standard props in Sargent’s studio. 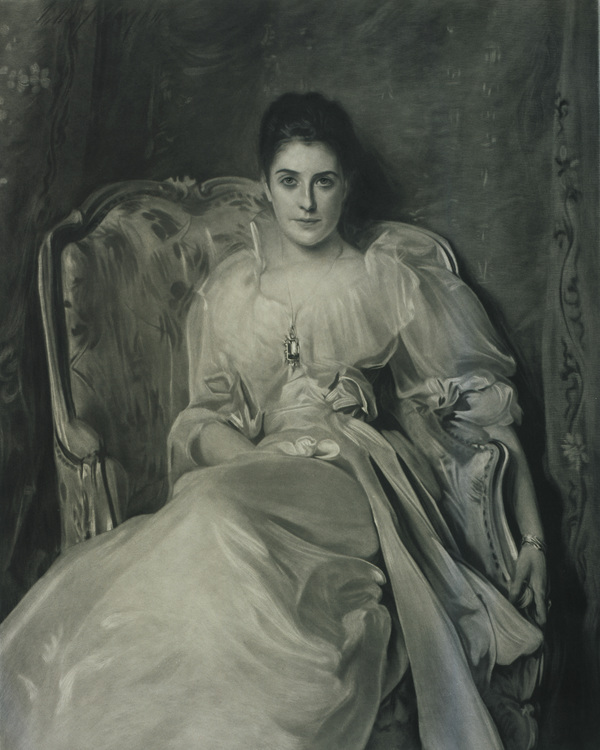 She is reported to have been of frail health; she recovered slowly from a severe bout of influenza in 1890 and was apparently still convalescing and suffering from exhaustion when she sat to Sargent, which may account for her slightly ghostly pallor in the painting. Lady Agnew fixes the spectator with an intelligent, faintly amused gaze but it is her elegant white silk dress and lilac sash that threaten to steal all our attention. There are brilliant passages of painting in the highlights, reflections and coloured shadows that show Sargent at his best as a painter of surfaces and textures, the ideal artist for a gilded, polished yet ultimately superficial society. Sargent’s image of Lady Agnew helped her to become a leading light in fashionable circles, holding lavish salons in her London home. Ironically, the high costs of this hospitality meant that she was eventually forced to sell some family pictures including this portrait which was purchased by the Scottish National Gallery in 1925.